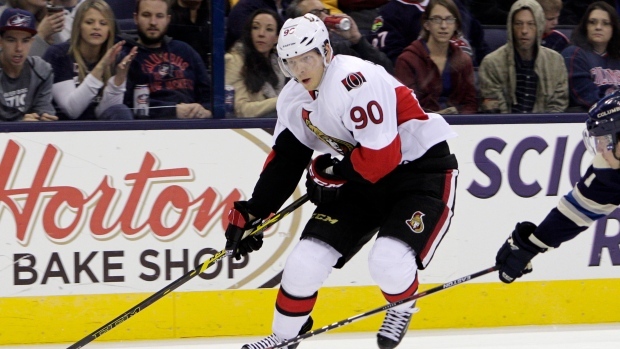 Ottawa Senators forward Alex Chiasson was awarded a one-year, $1.2 million contract by an arbitrator Sunday. TSN Hockey Insider Frank Seravalli reported that the restricted free agent had asked for $2.475 million in his hearing on Thursday while the Sens countered with a $1 million offer. The 24-year-old Canadian becomes the third player in the NHL since 2011 to reach a deal via arbitration. Kyle Cumiskey (2012) and Shea Weber (2011) were the previous two. "In our opinion, both sides made fair, detailed arguments and we are satisfied with the ruling of the arbitrator," Senators general manager Bryan Murray said. "We are happy to have Alex under contract and anticipate that he will be a productive player for us this season. Alex will be given the chance to have an important role in the team's success." Chiasson scored 11 goals and added 15 assists over 76 games in 2014-15, his first with the Senators. He was acquired via trade from the Dallas Stars on July 1, 2014 as part of the Jason Spezza deal. Mike Hoffman is Ottawa's last major RFA left to sign. Hoffman's arbitration hearing is set for Thursday.